Japanese people in China are Japanese expatriates and emigrants and their descendants residing in Greater China. There were 127,282 Japanese nationals living in People's Republic of China in 2009. About 105,764 Japanese nationals resided in Mainland China, 27,429 in Hong Kong and Macau, about 20,373 in the Republic of China. Tang dynasty China received 11 Japanese dancers as tribute from Balhae in 777. During the Second Sino-Japanese War, the Japanese government introduced a plan to settle 5 million Japanese in Manchukuo. Following the end of the war, approximately 2,800 Japanese orphans in China were left behind by families repatriating back to Japan. The majority of Japanese left behind in China were women, and these Japanese women mostly married Chinese men and became known as "stranded war wives" (残留婦人, zanryū fujin). Because they had children fathered by Chinese men, the Japanese women were not allowed to bring their Chinese families back with them to Japan so most of them stayed. Japanese law only allowed children fathered by Japanese fathers to become Japanese citizens. As of October 2009, the number of Japanese nationals living in China is 127,282 (including 21,518 in Hong Kong and Macau) according to a report by the Japanese Ministry of Foreign Affairs, the third largest group of Japanese people outside Japan after Brazil and United States. However, the 2010 Census of the People's Republic of China recorded 66,159 foreign nationals from Japan residing in Mainland China (figure excluding Hong Kong and Macau), representing nearly half of the Japanese Foreign Affairs Ministry figure. The number of Japanese emigrants to China and their descendants are unknown. In these ten years, Japanese nationals living in China increased roughly three times from 46,000 to 127,000 in proportion to the growth in trade volume between the two countries. 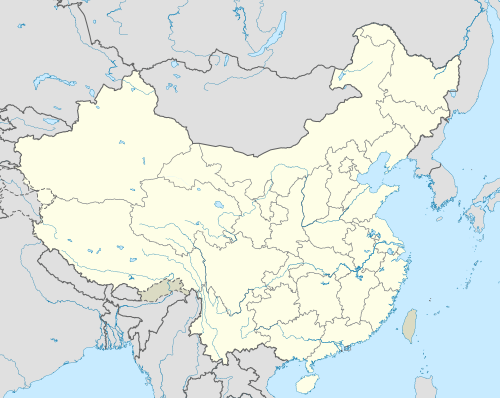 Gubei, Shanghai has the largest concentration of Japanese nationals in Mainland China. Shenzhen Saturday School (深・(ｼﾝｾﾝ)補習授業校 Shinsen Hoshū Jugyō Kō, formerly SHENZHEN日本人補習校) - Office on the 8th floor of the Jinsanjiao Building (金三角大厦/金三角大廈) in Baishizhou, Nanshan District. Previously based in the Ming Wah International Convention Centre (明华国际会议中心) in Shekou. ^ "Forgotten plight of foster parents". Xinhua News. 2005-04-22. Retrieved 2007-11-30. ^ "Major Figures on Residents from Hong Kong, Macao and Taiwan and Foreigners Covered by 2010 Population Census". National Bureau of Statistics of China. April 29, 2011. Archived from the original on 14 May 2011. Retrieved April 29, 2011. ^ "——" [The volume of Import and Export to China]. Trade Statistics of Japan. ^ "Japanese making Shanghai their home". CNN. 10 December 2010. Retrieved 29 November 2013. ^ a b "アジアの日本人学校一覧（平成26年4月15日現在）." Japanese Ministry of Education. Retrieved on January 12, 2017. ^ a b "アジアの補習授業校一覧（平成25年4月15日現在）" (). Ministry of Education, Culture, Sports, Science and Technology. Retrieved on February 13, 2015. ^ "学校案内." Japanese Weekend School of Nanjing. Retrieved on April 1, 2015. "所在地 南京国際学校(NIS)"
^ Home page. Ningbo Saturday School. Retrieved on March 31, 2015. ^ Home page Archived 2015-02-22 at the Wayback Machine. Shenyang Hoshuko. Retrieved on March 31, 2015. Old URL. ^ "学校概要 Archived 2016-03-04 at the Wayback Machine." Shenyang Hoshuko. Retrieved on March 31, 2015. "所在地 小書童教育連鎖機構瀋陽文芸路学習中心内(瀋陽市文芸路地王国際花園10号楼2号)"
^ "沈阳市组织机构代码管理办公室" (Archive). National Administration to Code Allocation to Organizations (NACAO; 全国组织机构代码管理中心). Retrieved on April 1, 2015. "沈阳市沈河区五爱街2号(地王国际花园东裙楼)"
^ a b "日本人学校・補習授業校一覧." Consulate-General of Japan in Guangzhou (在広州日本国総領事館/日本国驻广州总领事馆). Retrieved on December 21, 2017. "深セン日本人補習校 518052　広東省深セン市南山区白石洲金三角大廈８階" and "広東省 珠海市 珠海日本人補習校 519000 広東省珠海市吉大石花西路１６１号（珠海藤倉電装有限公司内）"
^ a b c "アジアの補習授業校一覧" (). MEXT. January 2, 2003. Retrieved on April 7, 2015. "青島 青島市彰化路銀都花園T5-2" and "蘇州 蘇州日本人補習授業校 （連絡先） 中華人民共和国江蘇省蘇州市新区獅山路１６号金獅大厦１０Ｄ住友銀行蘇州支店 （所在地） 中華人民共和国江蘇省蘇州市新区金山路１１８号蘇州外国語学校内" and "カルカタ 休 校 中" and "中華人民共和国広東省SHENZHEN市蛇口工業區亀山路８號「明華国際会議中心」"
^ "Home" (). Wuxi Japanese Saturday School. April 8, 2008. Retrieved on April 2, 2015. "所在地：無錫市新区行創四路88号　無錫国際学校国際部"
^ "無錫日本語補習授業校" (Archive). Wuxi Japanese Saturday School. Retrieved on April 3, 2015. "開校日：　2006年4月14日" and "住所：　無錫市新区行創四路88号　無錫東方国際学校内　無錫日本語補習授業校"
^ "アジアの補習授業校一覧（平成25年4月15日現在）" (). Ministry of Education, Culture, Sports, Science and Technology. Retrieved on February 13, 2015. "チェンナイ Japanese School Educational Trust of Chennai Inside American International School Chennai, 100 Feet Road, Taramani, Chennai, 600113, INDIA" "南京 Nanjing Japanese Saturday School 中華人民共和国南京市栖霞区仙林大学城　学衝路8号　南京国際学校内" and "珠海 広東省珠海市拱北九州大道西2001号　恒信工業区「QSI International School of Zhuhai」内"
^ "Home." Hong Kong Japanese Supplementary School. Retrieved on February 14, 2015. ^ "学校施設." Chengdu Hoshuko. Retrieved on April 1, 2015. "成都日本語補習校は、成都市内にある広島・四川中日友好会館の一室をお借りして授業を行っています。" and "成都日本語補習校四川省成都市武候嗣盛隆街9号"
^ "学校概要." Chengdu Hoshuko. Retrieved on April 1, 2015. ^ "学校施設." Chengdu Hoshuko. Retrieved on April 1, 2015. This page was last edited on 11 November 2018, at 19:12 (UTC).